K&L Electrical undertakes a range of earth bonding services for domestic properties, and are fully insured with £5,000,000 public liability insurance with professional indemnity. General Earth bonding for a domestic property.Earth bonding is designed to limit the voltage level of any accessible electrically conductive parts in order to reduce the risk of electrical shock.Most properties built before 1991 generally have the bonding wired in 6mm or 4mm cable, most don’t have any, if you would like your earthing system checked or earthing system upgraded please contact us or give us a call on 01925 225191 to arrange an appointment. 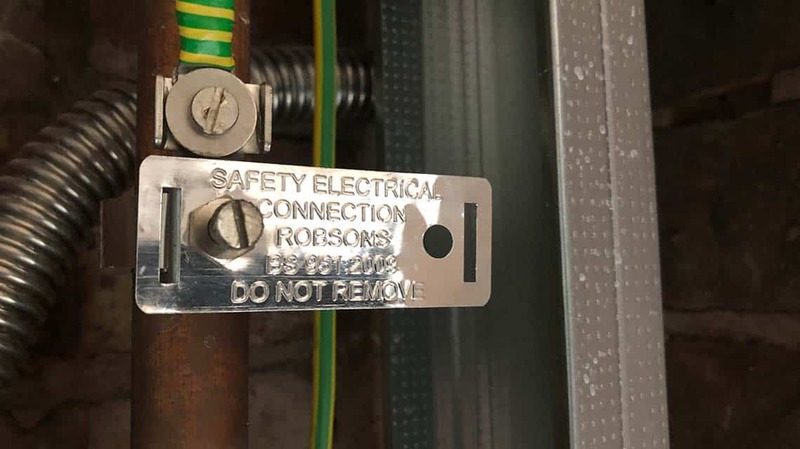 Most types of electrical installations are fitted with main equipotential bonding, which is the connection of the internal metallic water and gas pipes to the main earth terminal of the electrical installation. in particular, those installations with PME (protective multiple earthing) must, for safety reasons have this bonding fitted.The drawing below shows you how the earthing system should be in your property. Main Bonding conductors wired in 10mm going to your Gas meter and your water stop tap.If you have had an electrician tell you that you need to upgrade your earthing or there is no earthing and it needs to be installed, this is what he is talking about.To find out what it will cost to upgrade or install, click here to see earth bonding Prices the average price to install is £150 for both the gas and water bond. A drawing of the main earthing conductor from the power supply wired in 16mm cable, and the main Bonding conductors wired in 10mm going to your Gas meter and your water stop tap, the earth cable should be connected to a bonding clamp no more than 600mm from your gas meter and water stop tap. Often when you are having a new kitchen fitted or other work like an house extension that requires electrics installing the builder or electrician will check to see if the earthing is present and up to date, if its not, it will need to be installed. Call us to find out what it will cost to upgrade or install. We are fully insured with £5,000,000 public liability insurance with professional indemnity, fully compliant with the current health and safey legislation. Copies of these documents are available on request.We work efficiently and cleanly with minimal disruption, we will always ensure we leave your premises clean and tidy.Contact us for more information telephone us directly on 01925 225191.